Biggerplate.com, UK is one of the largest communities of mind map users in the world. You can download more than 400.000 mind maps for free. 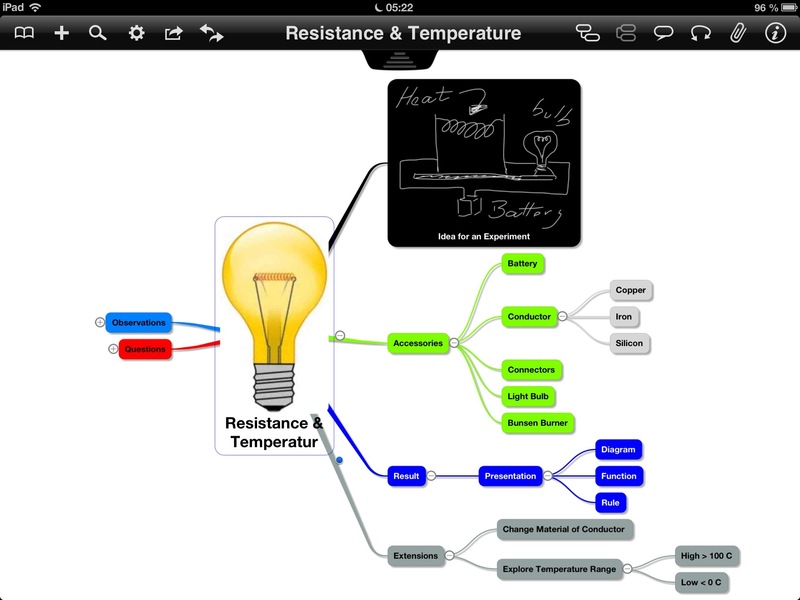 Mind Mapping can also be used for analyzing the user interface of an operating system. Here is a mind map of all functions of iOS 6 regarding security settings. 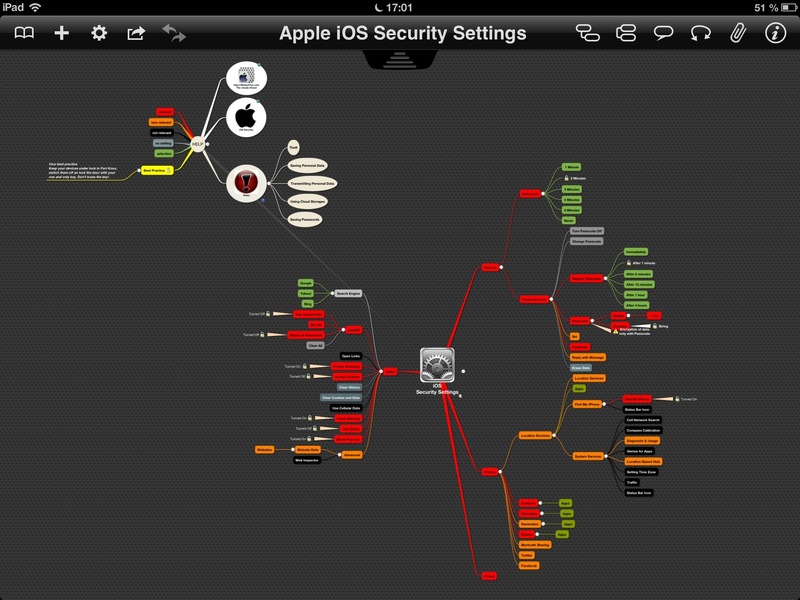 Converting the UI for security settings of an iPad or an iPhone into a mind map comes to benefits for users and developers as well. One mind map, less words, no screenshots and a complete overview for fast navigation. Apple’s User Manual needs more than 10 pages to explain these settings. They have to accept the following disadvantages as a result of displaying their concept as a mind map. There are many security settings spread over different menu items. The depth of some outlines is criticizable. There is no setting like ‘Security High, Medium, Low’ which adjusts all the other settings to appropriate default values. Mind Mapping is often a visual presentation of a brainstorming process. But it can be used as part of a user guide as well. A mind map, if not too complex, may be more suitable than a plain text for finding out the way to use the device. Usually menus are used for navigating through websites. Websites must have an attractive design so that visitors stay a bit longer than 2 seconds. The eyes surfing over a website classify this site as attractive or not within parts of a second. There are many websites trying to keep the customers by using the whole spectrum of available colors or tons of images. In some cases it may be the right strategy but this is not applicable to reputable companies. No guts, no glory! 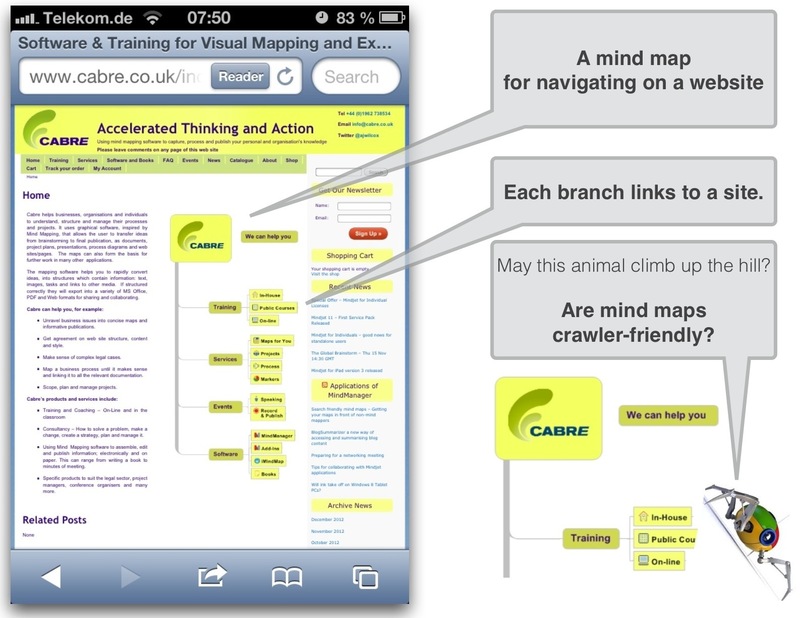 Interactive mind maps could be a new approach to website design and may oil the wheels. a company of Andrew Wilcox, UK. Cabre helps businesses, organisations and individuals to understand, structure and manage their processes and projects. It uses graphical software, inspired by Mind Mapping, that allows the user to transfer ideas from brainstorming to final publication, as documents, project plans, presentations, process diagrams and web sites/pages. The maps can also form the basis for further work in many other applications. The mapping software helps you to rapidly convert ideas, into structures which contain information: text, images, tasks and links to other media. If structured correctly they will export into a variety of MS Office, PDF and Web formats for sharing and collaborating. On January 31, 2013 Andrew Wilcox reported on Biggerplate Unplugged Event, London about the essential problem when using mind maps on websites. Do you want the masses to see your maps? Of course you do. Google likes words, but can it see the words on your map? Andrew will provide a few tips to help you get your maps found by google and therefore your intended audience. Sitemaps, categories and tags are for structuring a website. It’s a challenging project to go a new way in visualization, organization, and summarization of the informations found on websites. I think everybody using the internet suffers under thousands and thousands of single informations not connected to each other except via links. But what should the user do, to extract and summarize all this. Is there no support available except one’s own brain? We have such an high-octaned computer power and lots of creative developers who could help us. So the idea of Henry Lewkowicz at Context Discovery is a great step forwards. Henry Lewkowicz launched a further project (in beta phase) which summarizes blogs. BlogSummarizer summarizes all blog posts and then creates a blog companion knowledge base. In the knowledge base all posts are linked by keywords and summaries to show the overall context of any topic discussed in the blog. The results are exportable to HTML and mind mapping applications for easy sharing. Any blogger on WordPress and Blogspot platforms can use BlogSummarizer to create a companion knowledge base for their blogs. Bloggers can register on BlogSummarizer to create a knowledge base and visualize the results with a mind map. I’m sorry, my article is getting longer and longer. The above mentioned blog contains an interactive mind map. And here we come to a relevant problem of mind maps on smartphones and tablets but even on computer displays depending on the number of branch levels. Viewing more complex mind maps means to continuously zoom in and out, swipe left and right and up and down. Mind maps need an enormous space when it comes to expand the branches. Smartphones and tablets are gaining popularity in a way that sales of traditional devices like notebooks and desktop computers are rapidly decreasing. If the tablet will be the standard device in the near future does it hamper the further development and application of mind maps used for other scopes than personal brainstorming? This website hopes to see you again on Feb 07 when Mind Mapping part 3 is presented. Thanks to all of you for reading my blog.